Is there an identity crisis for France? “Anglo-Saxon in outlook”: French newspaper Midi Olympique has said French rugby has lost its identity. Is it true? The editorial in Monday’s edition of Midi Olympique pulled no punches. The national team is beset by a “gloomy lassitude”, declared the paper, brought on by a year in which Les Bleus have won just one of their eight Tests, a 23-16 victory against Scotland on the final weekend of the Six Nations. Not that it did France much good: they still finished bottom of the table, their first Wooden Spoon in 14 years. That sorry roll call of results could of course change in the next month, if France were to beat New Zealand, Tonga and South Africa on consecutive weekends. Then again, if the French don’t show a vast improvement on the form they displayed on their disastrous summer tour to New Zealand, where they were whitewashed in the three-Test series, they could end up losing all three. Don’t forget Tonga beat France 19-14 in their pool A clash in the 2011 World Cup. What troubles Midi Olympique isn’t so much the results, grim as they are, more what they describe as “the loss of identity of our rugby”. Zut! How could a nation that gave the world such greats as Gachassin, Boniface, Blanco, Sella and Castaignede be transformed into a side so…well, so Anglo-Saxon in outlook. “From where comes this last decade without brio, based solely on defence and the set-piece?” wails Midi Olympique. Ah, fly-half, the position Midi Olympique calls the “eternal problem” facing France in the last dozen years. Not since wee Thomas Castaignede made the position his own for a couple of glorious years in the late 1990s have France produced a ten capable of world-class consistency. Frederic Michalak has had his moments, Francois-Trinh-Duc too, and it was even rumoured David Skrela once produced a decent 80 minutes of rugby. But oh how the French XV have cried out for a Carter, a Larkham, a Wilkinson, an O’Gara. 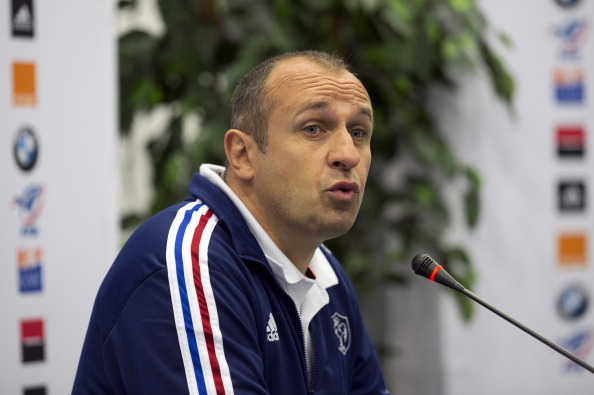 Patrice Lagisquet, the third member of France’s coaching triumvirate, told Midi Olympique on Monday that they have five fly-halves to choose from: Camille Lopez, Remi Tales, Trinh-Duc, Michalak and Jules Plisson. Only two of those five – Lopez and Tales – are in the squad for the November Tests though Lagisquet stressed all will be in contention come the Six Nations. The pair have four caps between them and just two starts – both on the summer tour to New Zealand – but their inexperience is balanced by their intelligence. Lopez, at 24 five years younger than Tales, moved to Perpignan from Bordeaux in the summer and is prospering at his new club. He’s made no secret of the fact he’s modelled himself on Jonny Wilkinson – though Lopez has more natural attacking instincts than his idol – and his composure was evident when he made an accomplished debut against the All Blacks in June. He’s also prospering from playing in a backline containing James Hook, though ironically the presence of the Welshman may have diminished Lopez’s status in the eyes of Saint-Andre. Lopez was the goal-kicker at Bordeaux, kicking 232 points last season, but at Perpignan that role belongs to Hook. Tales, on the other hand, has never been much of a goal-kicker. What he is, however, is an authoritative fly-half, not that common among French tens, a player who, as he showed in his masterly display against Biarritz at the weekend, can create chaos for opponents with his crafty skills. He’s turned a corner, but can Tales turn France into the side we all used to love watching?